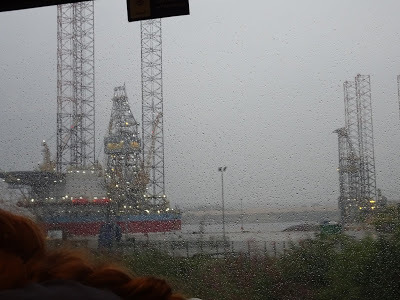 We had a spare hour and a quarter before meeting our taxi who was taking us to the train station, so we hopped on to the tram and headed off towards the airport. 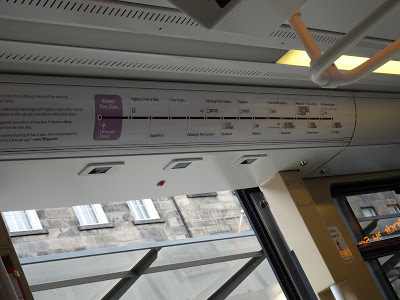 The idea was to see some areas we had not seen so far we saw Haymarket, Murrayfield Stadium (the home of Scottish Rugby) and Saughton where we hit our time limit for travelling outbound so got off and crossed to the other side of the tracks ready to catch the next tram back. The tram back was very full with standing room only. Kaye was offered a priority seat which she took and two stops before we had to disembark I got a seat too. 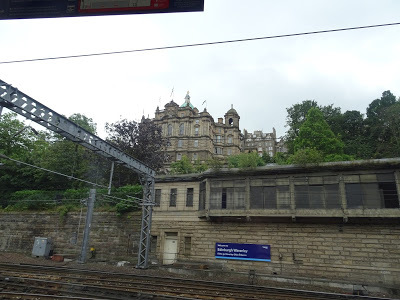 The taxi driver took us to a hidden drop off point at Edinburgh Station which provided easy lift access to the platforms where we caught our train to Inverness. 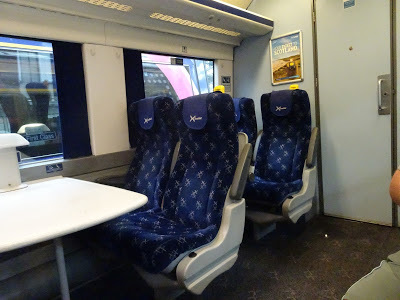 The Scotrail commuter train train trip to Inverness was lovely. 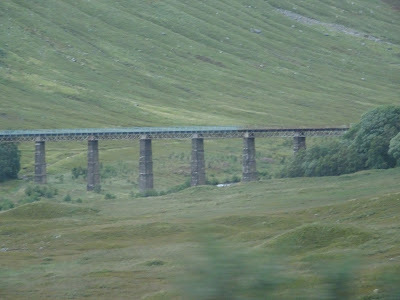 Many of the stations were in the Cairngorms National Park, which was enormous. 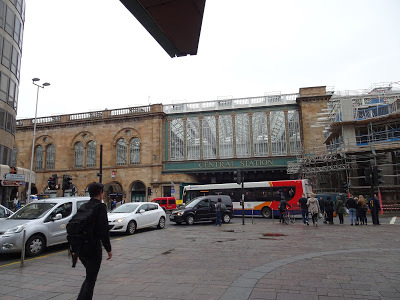 Edinburgh Waverly station had 20 platforms but Inverness station has only 7. 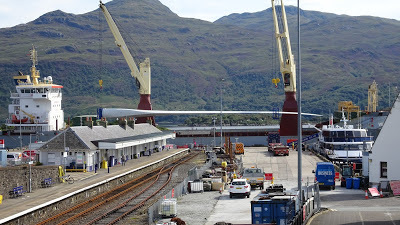 We left our hotel about 10.30 and strolled to the railway station boarding the Scotrail train to Kyle of Lochalsh which departed at 11. 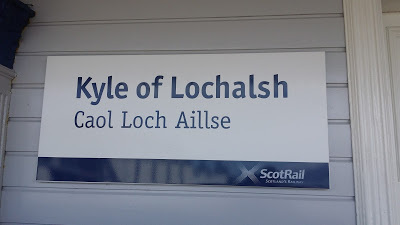 The train passed through Beauley, Muir of Ord, Dingwall, Garve, Lochluichart, Achanalt, Achnasheen, Achnashellach, Strathcarron, Attadale, Stromeferry, Duncraig, Plackton, Duirinish before arriving at Kyle of Lochalsh. 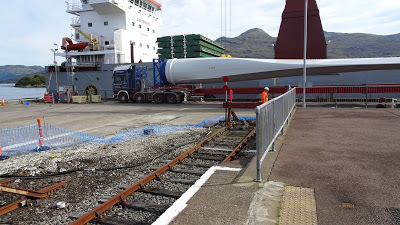 We watched as they unload a wind turbine blade off a cargo ship and looked in the gift shop at the station and the lady who ran it said that today (15th August) was the first day without rain since 30th May. Lucky us!! 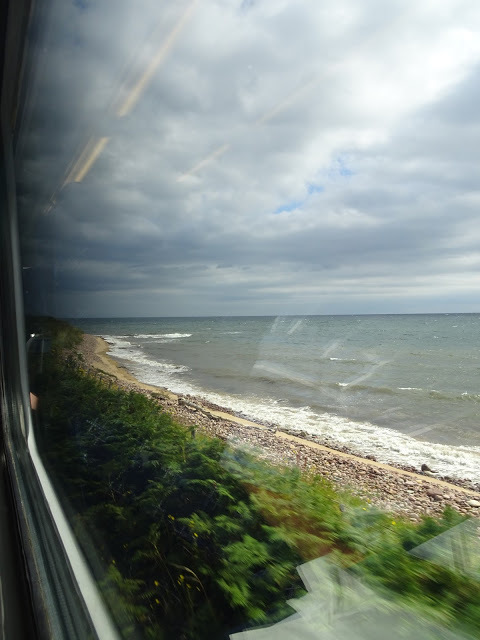 We rode the train back to Inverness getting back just after 8pm. Unfortunately for all us passengers in the front carriage that the air-conditioning had died and was unable to be repaired in the field. It did get quite warm and there were a couple of times where the driver got out at a station and had a walk around because he was so hot in his driver’s cabin. No air-conditioning for him either! 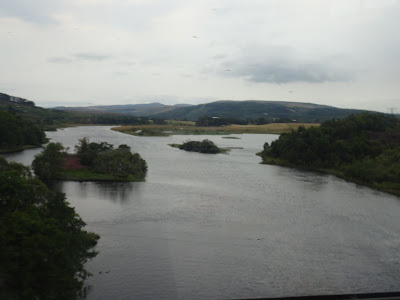 We left Inverness in our Scotrail train on time and passed through Beauly, Muir of Ord, Conon Bridge, Dingwall (those four the same as the Kyle of Lochalsh train), Alness, Invergordon, Fearn, Tain, Ardgay, Culrain, Invershin, Lairg, Rogart, Golspie, Dunrobin Castle, Bora, Helmsdale, Kildonan, Kinbrace, Forsinard, Altnabreac, Scotscalder, Georgemas Junction, Thurso and arrived at Wick. At Invergordon it obviously was an area for manufacture and/or maintenance of oil platforms as there were more than a dozen in the estuary. 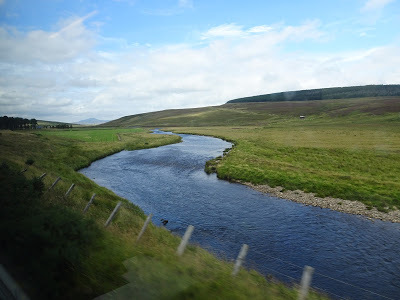 It was a nice ride as the train route follows the coast but weaves inland where we follow streams or rivers and climb through valleys then descend to the coast again. 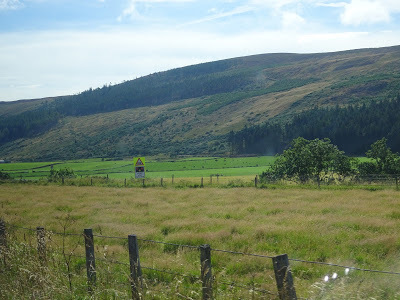 Between the hills and the water, it is mainly farming land. 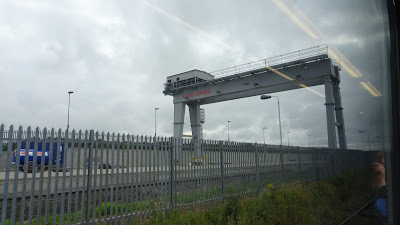 At Georgemas Junction I noticed that they have constructed a new freight unloading facility complete with a 110 ton fixed gantry crane. 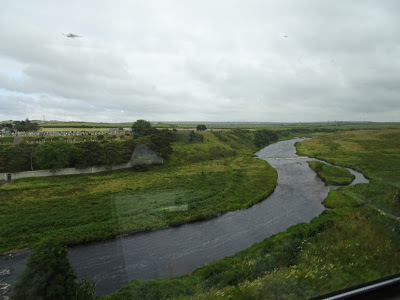 We went back down a branch line to Thurso to drop passengers then return to the junction and on to Wick. After disembarking we walked into the main street found a cafe had a small bite and a drink. We wandered back up the hill to the station and arrived 10 minutes before the train left for the return journey. 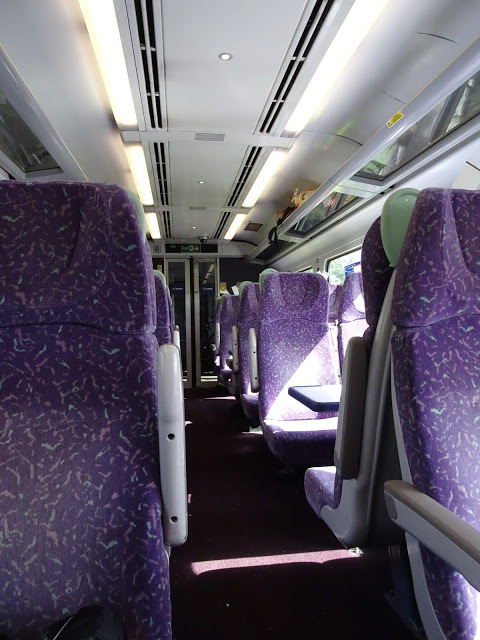 The train was away on time and we were seated in different seats this time on the other side of the carriage. 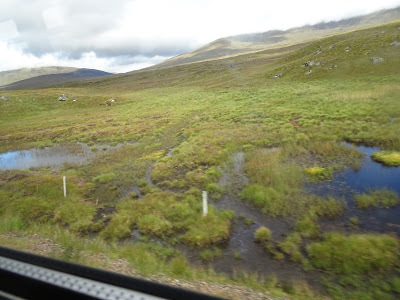 The tracks have lots of jointed rail – so many clickety clacks – welded rail is just soo much quieter to ride on. We went past the Glenmorangie distillery during the ride. Upon our return to Inverness around 8.15pm we dropped into the pub across the road from out hotel to get a bite to eat. Taxi to Fort William station ready for the trip to Glasgow. At the station, there were people everywhere!! Sitting on the dozen or so available seats, sitting on the ground, sitting on their suitcases… anywhere they could find. Most of them had backpacks – very, very large backpacks & rucksacks and quite a few of them had their walking poles also. Based on the number of people waiting in the station at the time, plus all the others who continued to arrive while we were there, we thought that this train would be packed. 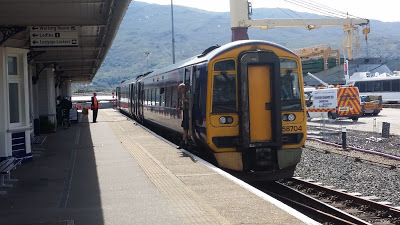 Initially we thought there were only going to be two coaches on the train back to Glasgow but fortunately there were four coaches, however as the train had departed from Mallaig, there were already quite a few passengers already on board heading towards Glasgow. Trying to get on board the train was almost like a polite bun-fight, with people trying to grab some space for their luggage and then someone else later moving the luggage. At least ours stayed on the train but not where we originally placed it. 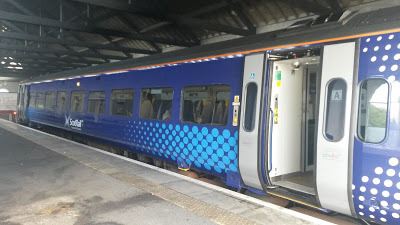 The Scotrail train departed Fort William calling at Spean Bridge, Roy Bridge, Tulloch, Corrour, Rannoch, Bridge of Orchy, Upper Tyndrum, Crianlarich, Ardlui, Arrochar & Tarbet, Garelochhead, Helensburgh Upper, Dumbarton Central, Dalmuir and finally at Glasgow Queen Street. 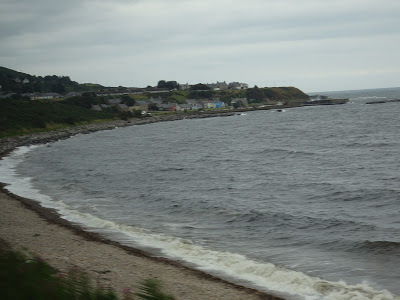 The train once again traversed the Glens and lochs and along the coastal inlets as we went from the highlands to the lowlands. 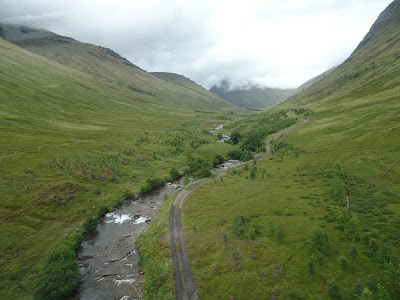 The scenery changed from high mountains with glens between them and in the highlands there was a distinct lack of farm animals as it was very rocky and wet. In the highlands we saw snow fences and went through a snow shed near Corrour. It was very desolate. Being the last day I could use my Britrail pass as my first use was 30 days ago Kaye wanted to ride to Glasgow and back. 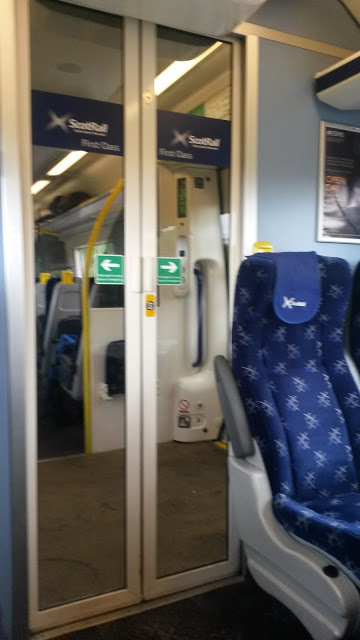 We made our way to Glasgow Central Station and found an entrance without steps and located a departures screen and found an Edinburgh train leaving in about 10 minutes but no platform listed. The station has more than one level so had to ask which level to go to. 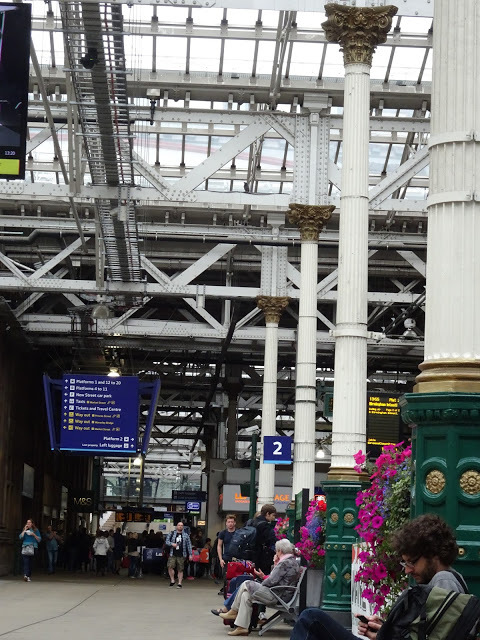 Station assistant looked at me funny and said once an hour upper level but every 10 minutes from Queen Street Station…. 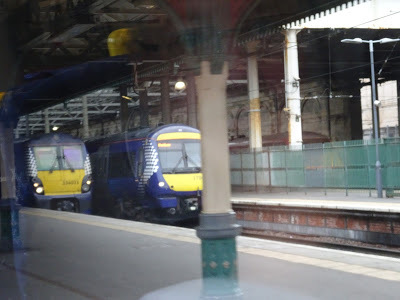 Kaye said that 11.17 did not appear on the timetable she had… turns out there are four Scotrail routes to Glasgow and we had not worked that out. 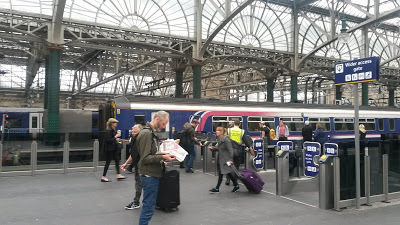 All of Kaye’s research had shown four or six stops but the one we caught departed Glasgow Central stopping at Uddingston, Bellshill, Holytown, Carfin, Cleland, Hartwood, Shotts, Fauldhouse, Addiewell, West Calder, Livingston South, Kirknewton, Curriehill, Wester Hailes, Kingsknowe, Slateford, Haymarket before arriving at Edinburgh Waverly – it was the 2nd class commuter service. So the one hour trip took over an hour and a half!!!! 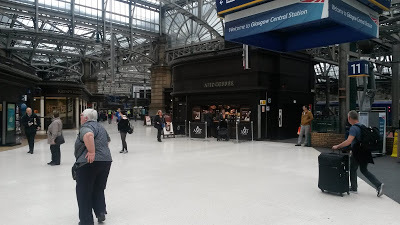 We decided to have lunch in the Waverly Mall at the place that serves nice baked potatoes – we ate there before when we stayed in Edinburgh – then took the train back to Glasgow but this time to Glasgow Queen Street. 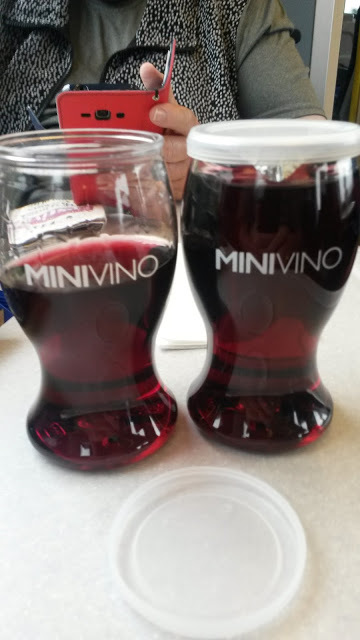 This train had a separate first class section and Wi-Fi so a couple of red wines along the way for me and tea for Kaye. 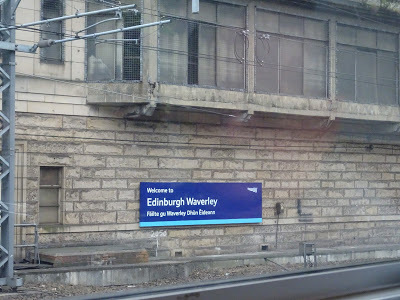 We left Edinburg Waverly calling at Falkirk High, Croy before arriving at Glasgow Queen Street. This is a much faster service than what Kaye had looked up! 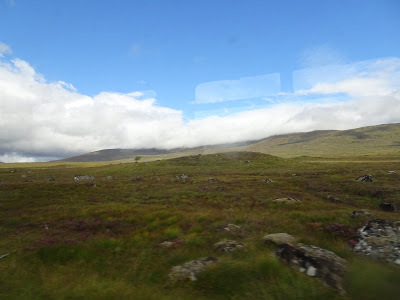 It was surprising how different the scenery was on the two different train routes. 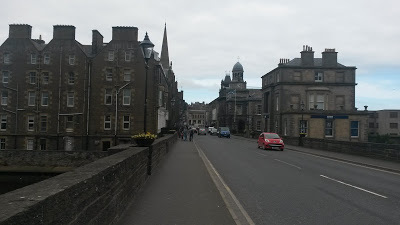 First trip was quite urban and eventually becoming rural, whereas the return trip was mostly rural. 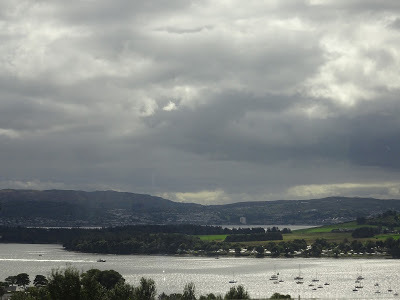 From Glasgow we traveled to Ireland and did not have any further train travel.